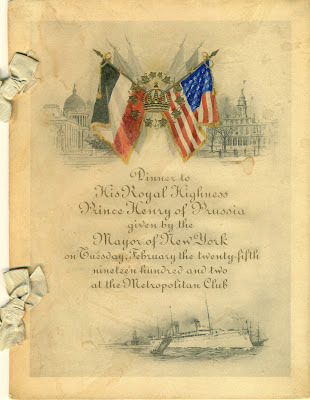 There was an intriguing story behind the menu that supposedly came from the state dinner in 1902, hosted by President Theodore Roosevelt for Prince Henry of Prussia. 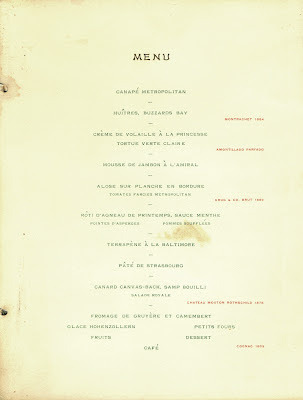 The biggest issue was its monotone blue cover, unlike the full-color menus seen at the dinner. Then there were two small advertising cards still tucked inside, one noting that the menu was provided compliments of George Kessler, the clever importer of Moët & Chandon Champagne, and the other touting his product’s popularity. 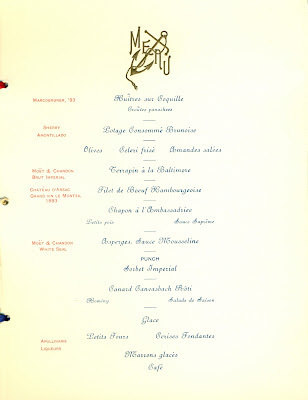 The menu reveals a curious incident in presidential history, orchestrated by Kessler to promote his products. Known as the “Champagne King,” he led a colorful life, distinguished by high living, intermittent disasters, and a celebrated act of atonement, making his one of those uniquely American stories. 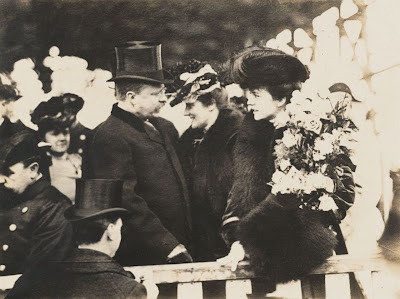 When Prince Henry came to the United States in February, Roosevelt had been president for only five months, following President McKinley’s assassination in 1901. The new administration exuded a more youthful and energetic tone when it came to entertaining, as shown by the menu below, reflecting one of the finest banquets held at the White House up to that time. 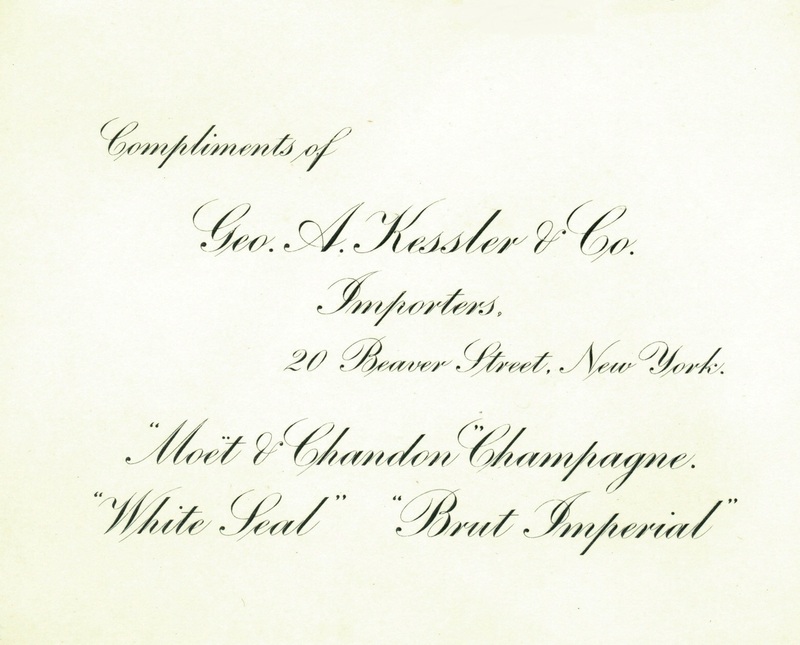 George Kessler’s brands of Champagne played an unusually prominent role in the dinner. In fact, Kessler used the White House dinner as a marketing opportunity to promote his products. 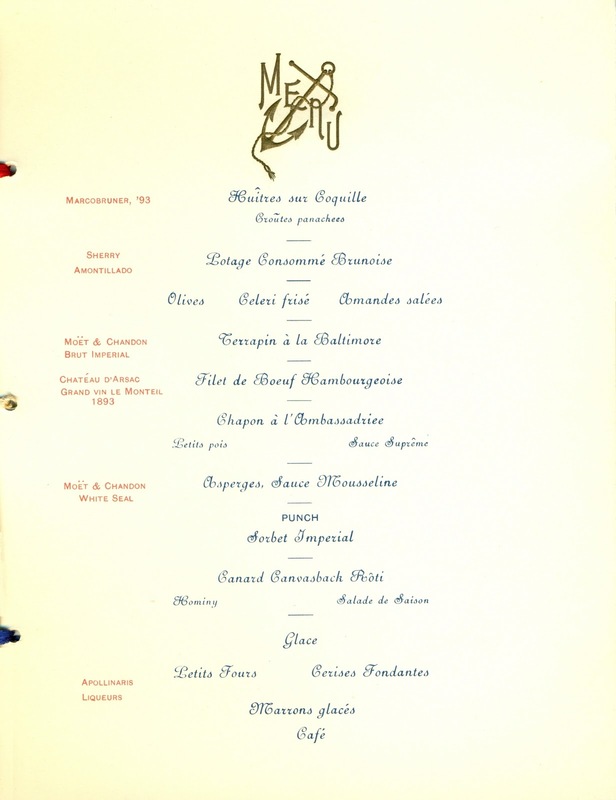 In addition to providing free Champagne, and bribing various people to go along with his scheme, it is highly likely that Kessler provided the menus for this occasion, especially since the White House did not have menus printed for state dinners between 1877 and 1953. 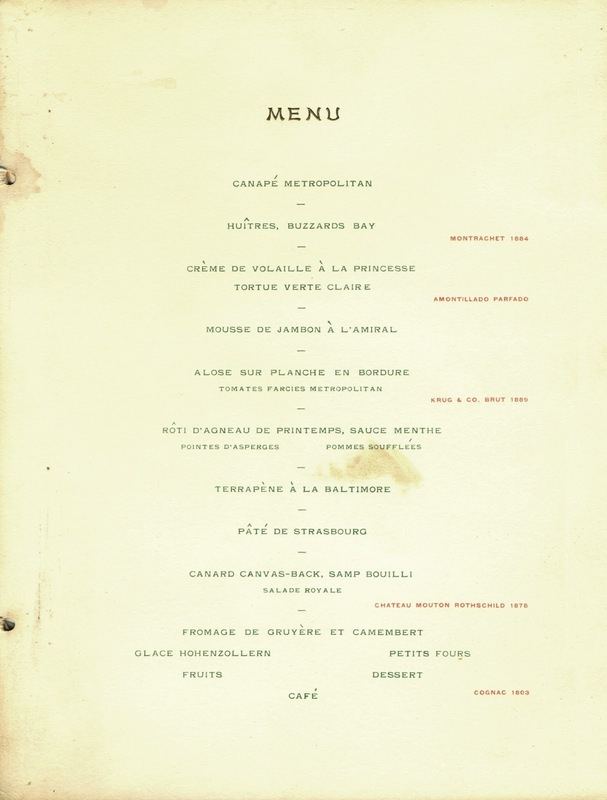 Indeed, two different versions of the menu were produced by the stationer Dempsey & Carroll—the one above with the blue cover was made for promotional purposes, showing that Moët & Chandon was served at this important state dinner. The menus actually used at the banquet were given covers printed in full color, as shown below. 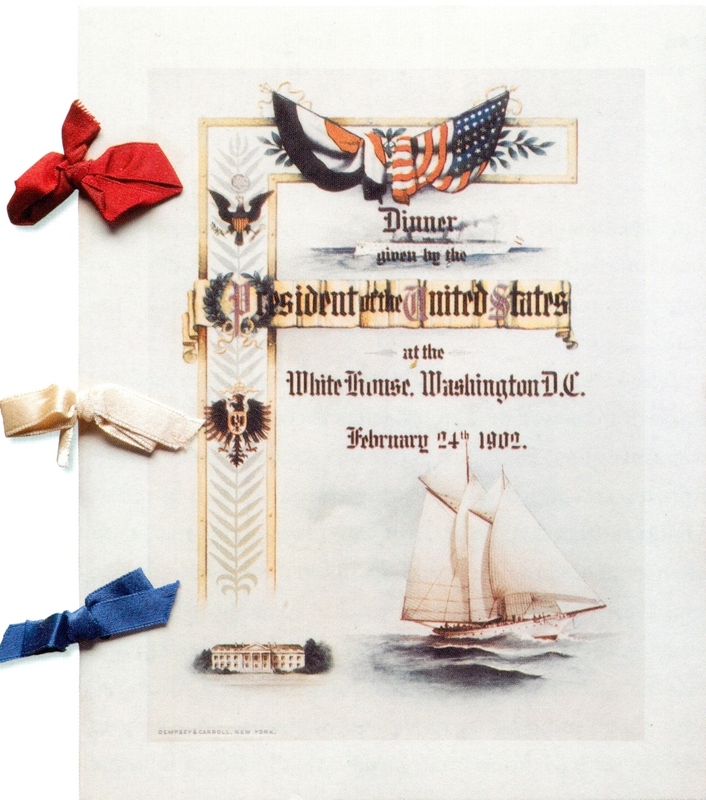 Both types were bound using red, white, and blue silk ribbons. Amassing a fortune as an importer, Kessler was socially active in high society and understood the foibles of the rich. He promoted his Champagnes by insuring that they were seen being consumed by the right people in the right places. When dining out in New York, he would often size up the dining room, before sending a bottle of Champagne with his compliments to a table seated with fashionable socialites. He even provided free Champagne for the private cellars of society’s most prominent members, knowing that others would emulate what they were serving. 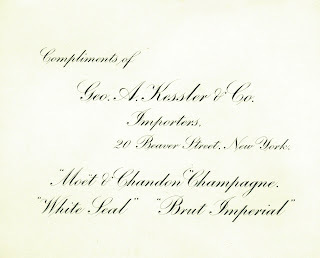 Kessler also hosted the sort of lavish dinner parties that typified the age, generating publicity that enhanced the image of Champagne as a symbol of luxury. 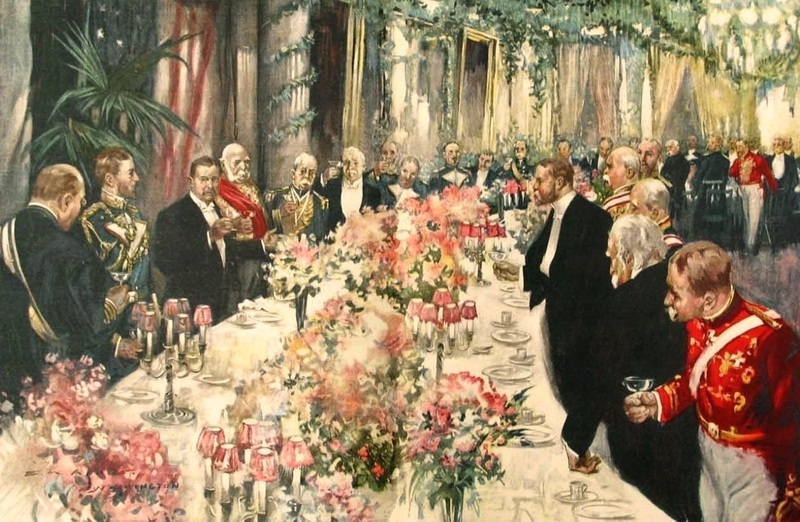 For one such event, he had the central courtyard at the London’s Savoy Hotel flooded, creating a Venetian lagoon stocked with live swans, ducks, and salmon trout. Taking the newly-developed concept of “conspicuous consumption” to a new level, his guests dined in an enormous gondola, where they would later listen to arias sung for them by tenor Enrico Caruso. And as if that were not enough, a baby elephant lumbered in for the finale, bearing an enormous cake. The official purpose of Prince Henry’s visit in 1902 was to pick up the 161-foot yacht that had been built in America for his brother, Kaiser Wilhelm II, the German Emperor. Accordingly, after the state dinner at the White House, everyone went down to Union Station to board special trains that would transport them overnight to northern New Jersey, where they would preside at the launching ceremony. The next morning, inventor Thomas Edison was waiting at the Townsend-Downey Shipyard on Shooter’s Island in Newark Bay, ready to capture the moment of their arrival on film. Standing with the dignitaries on the launching platform, Alice Roosevelt, the president’s daughter and debutant of the season, did the honors, christening the new schooner Meteor, using a bottle of Kessler’s White Star Extra Dry Champagne. 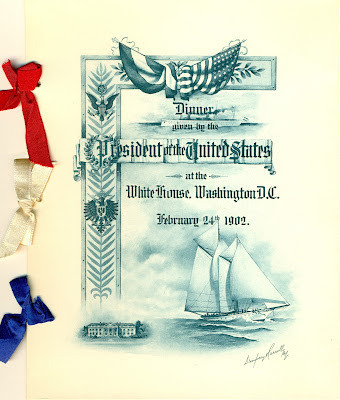 The presidential party then proceeded to the shipyard’s mold loft, festooned with flags and banners for the occasion, where tables were set for lunch. 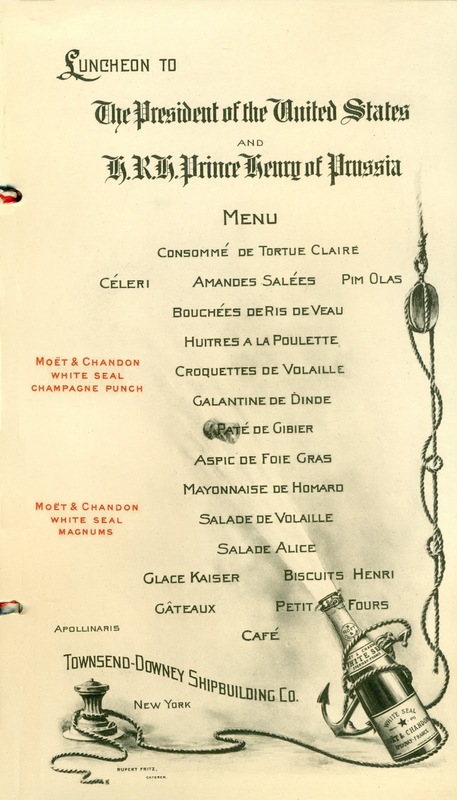 The menu shown below, also made by Dempsey & Carroll, most certainly at George Kessler’s expense, has an illustration of a Champagne cork flying straight over the bill of fare, featuring dishes with fanciful names like salad Alice, glace Kaiser, and biscuits Henri. 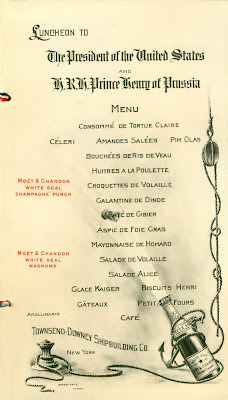 Although his name was the only one to appear on the menu, Rupert Fritz was one of twenty-five German-American caterers from New York who prepared the banquet for 2,200 people.2 As shown, Kessler's brands were exclusively served—magnums of Moët & Chandon and great bowls of White Star Extra Dry Champagne punch. 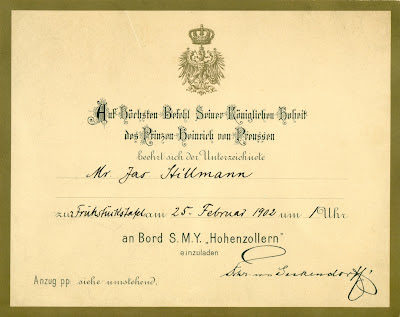 Sitting on the dais for a few minutes, the president and the prince exchanged toasts with glasses of Champagne, amidst the cheers of the large crowd, before leaving to attend a smaller luncheon on board the Hohenzollern, the German ship that sailed into New York Harbor three days earlier, bringing the prince to the United States. As reflected by the admission ticket shown below, this was a more exclusive gathering. It was here that Prince Henry presented “Princess” Alice, as the president’s daughter was called by the press, with a gift from the Kaiser—a gold bracelet mounted with a portrait of the German Emperor surrounded in diamonds. 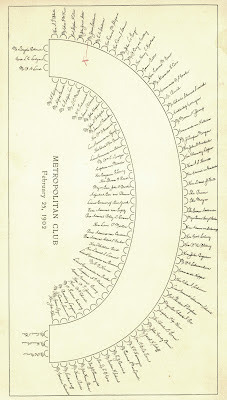 President Roosevelt returned to Washington after lunch, while the prince proceeded to New York City to attend a dinner in his honor at the Metropolitan Club. 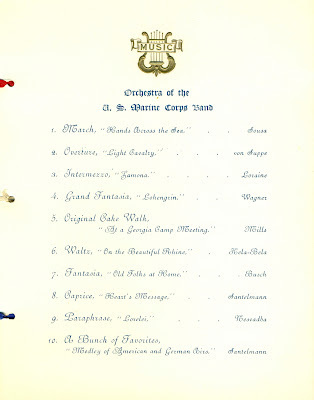 The banquet menu shown below includes terrapin à la Baltimore and Canvasback duck, the great American delicacies served at the White House the night before. This menu also had two cards tucked inside—a note with instructions for the diners and the small seating chart shown below. The place marked in red pencil was reserved for businessman James Jewett Stillman, still considered one of the hundred richest Americans who ever lived. 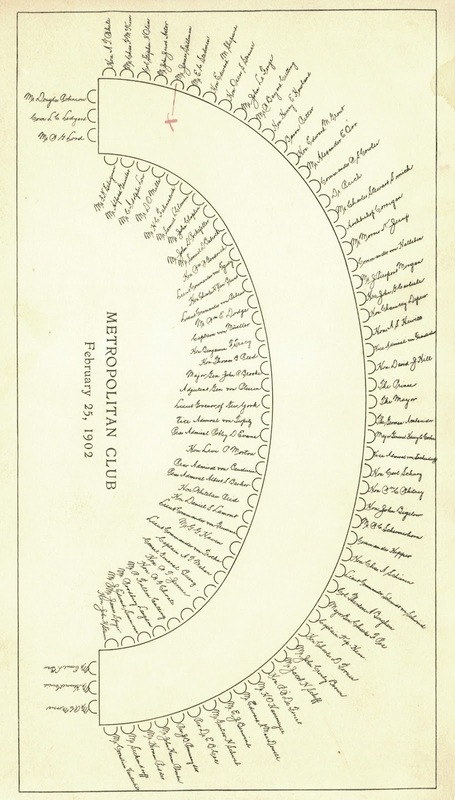 Other wealthy financiers in attendance included Cornelius Vanderbilt, John Jacob Astor, and J. Pierpont Morgan. Notably absent at this banquet was Moët & Chandon Champagne, suggesting that it was more difficult to bribe your way onto the menu at the Metropolitan Club, than it was at the White House. Indeed, the scandal must have been distasteful for President Roosevelt, a reform-minded politician who fought corruption. It is interesting that two months later, the president sent a memorandum to Henry Pinckey, the White House steward, instructing him to serve only Ruinart Champagne at an upcoming state dinner. Prince Henry’s trip to the United States in 1902 was one of the most momentous royal visits in the nation’s history. During his two-week tour, he was greeted by a frenzy of enthusiasm, particularly in the cities with large German-American populations. Unfortunately, the warm feelings of his goodwill tour soon faded, as the details of George Kessler’s shenanigans began coming to light. For one thing, it was confirmed that he had supplied free Champagne for the White House dinner and the luncheon on Shooter’s Island. It was also discovered in testimony that Kessler gave the shipbuilder $5000 to substitute a bottle of his Champagne for the Rheingold wine that the German Embassy provided for the launching. 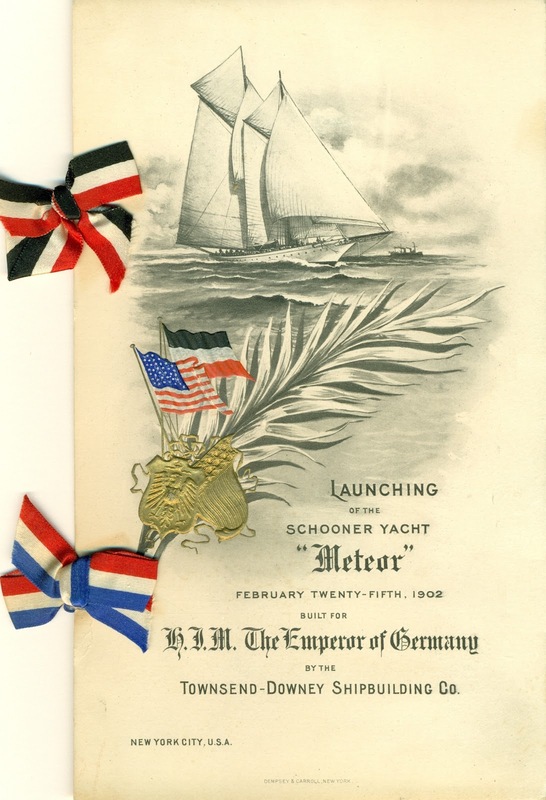 This was a big problem, for it turned out that the schooner was a German imperial vessel, and as such, it could only be christened with German wine, as mandated by law. The newspapers in Germany were in an uproar—a bottle of French Champagne had been cracked over the bow of the Kaiser’s new yacht! The situation became so tense that German Ambassador was recalled for a time. After things settled down, Kessler sent the Kaiser a duplicate of the bottle used to christen his yacht. 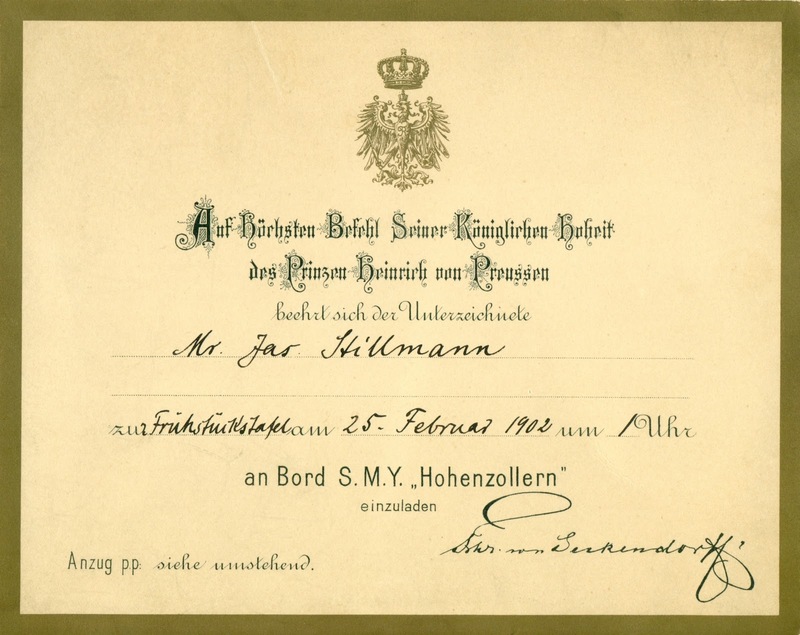 It was reportedly put on display in the Hohenzollern Museum, giving the wily importer even more publicity. Although Kessler was well known for his marketing antics, it was the major disasters of the era that ultimately distinguished his life. For example, he was in San Francisco when the great earthquake struck in 1906. Rushing out of a building just before it collapsed, he later sent a boxcar of Champagne to the victims of the earthquake and fire, displaying a “touching concern for human suffering,” according to some accounts. However, the next time he barely escaped a catastrophe, his reaction was much different. 1. Long the “Holy Grail” of antique collectors, the priceless glass screen made by Tiffany's is now believed to have been auctioned off, and later installed in the Belvedere Hotel in Chesapeake, Maryland, where it was destroyed by fire when the hotel burned down in 1923. Maine Antiques Digest, January 2007. 2. Rupert Fritz declared involuntary bankruptcy a month later, somehow pushed into insolvency by acting as the lead caterer for the large royal event. 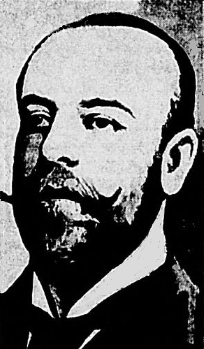 New York Times, 27 March 1902. Outrageous! Just goes to show, some things are still the same. Interesting that Ruinart was acquired by M&C in 60s. Terrific info. and great story. Thanks! I am always so impressed when I come here... and learn so much. Great piece.